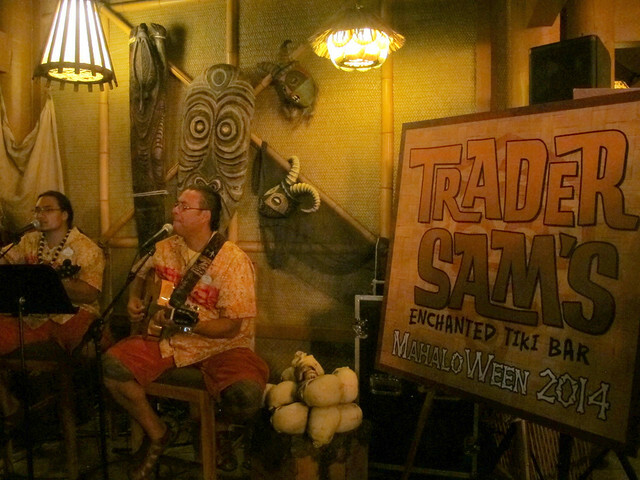 This past Monday, Disney hosted a “Mahaloween Luau” at Trader Sam’s Enchanted Tiki Bar. The price for the special event was steep ($125 per person) though Disney seemed to have little trouble selling out each of the four hour-long sessions. 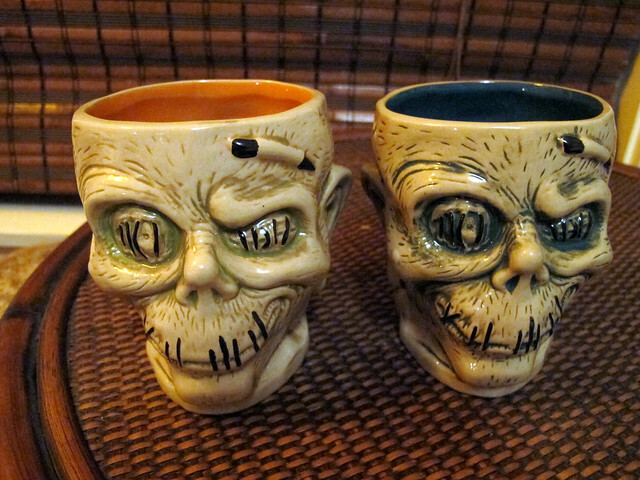 Anyway, the event was held in anticipation of the release of a new glaze of the Shrunken Zombie Head mug. 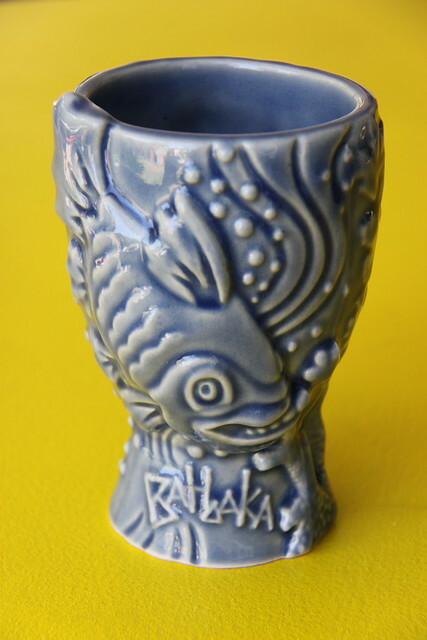 (I featured the original blue version on my list of Top 5 Spooky Tiki Mugs last year.) The one on the left with the greenish tint and orange interior is the mug that’s now available at Trader Sam’s, while the mug on the right with teal highlights was exclusive for Mahaloween. Servers were ready with trays of Shrunken Zombie Heads (to be redeemed with our two drink tickets) and there was a buffet table piled with tuna poke cones and chicken lettuce cups with ginger hoisin sauce. 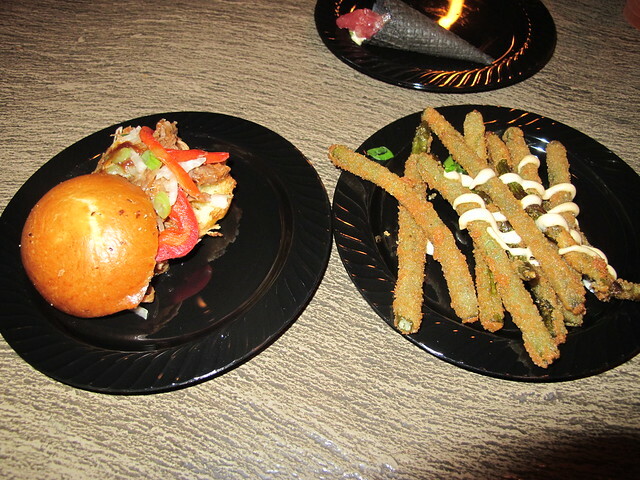 Pulled pork sliders and plates of our favorite panko-crusted Chinese long beans with Sriracha aioli made the rounds later on. The food was very good, but seating was limited and it was difficult to eat unless you had snagged a table. My favorite part was hearing about repurposed designs. 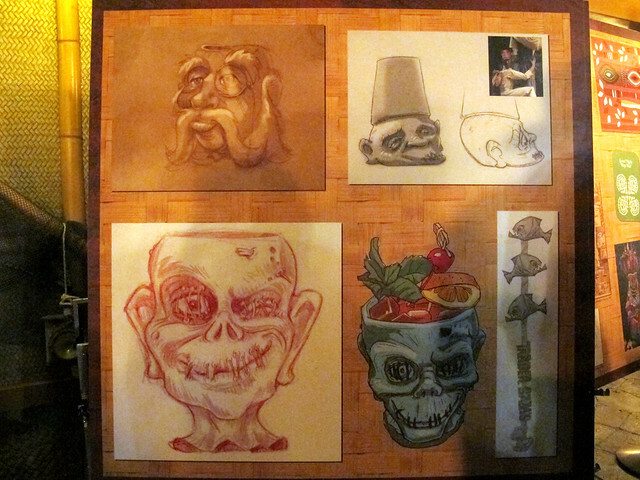 As Brandon said, at Disney: “No idea idea ever fully dies.” The shipwreck in a bottle effect at Trader Sam’s was originally considered for Disneyland’s Haunted Mansion, as seen in the top left design by Elmer Plummer from 1968. Some folks might remember that it was part of the dearly missed Adventurers Club at Pleasure Island in Disney World (Tim Kirk art, 1987). The shipwreck was brought up once again for the Haunted Mansion in 2002. 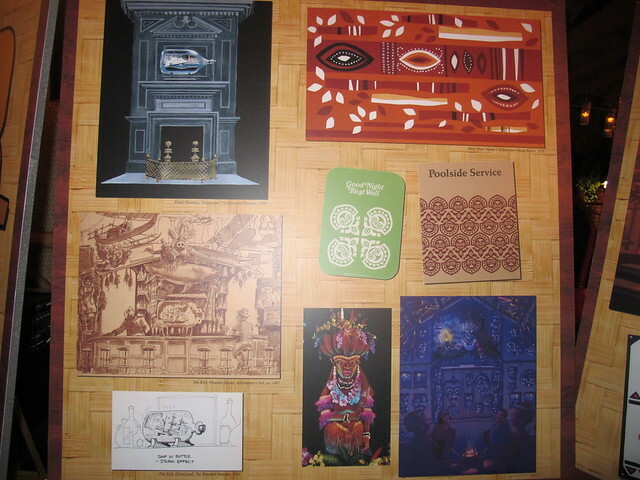 Meanwhile, Mary Blair‘s 1970 abstract art for Disney’s Polynesian Resort forms the wallpaper pattern in the Trader Sam’s bathrooms. 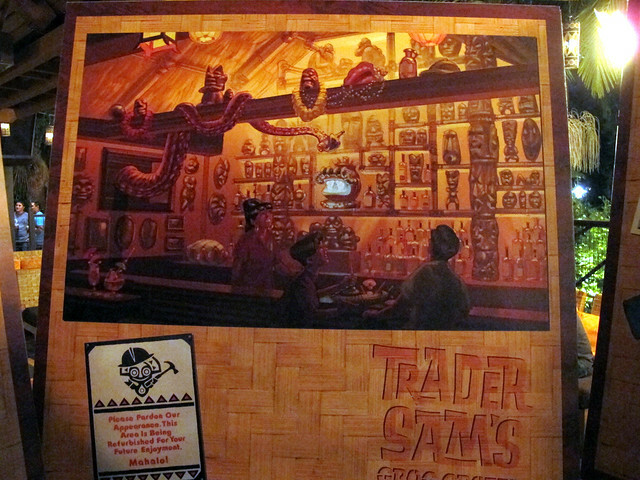 And finally, the Tiki Goddess formerly featured in Florida’s infamous Enchanted Tiki Room: Under New Management will apparently glower over the patrons at Trader Sam’s Grog Grotto, which is scheduled to open at Disney’s Polynesian Village Resort in Orlando in early summer 2015. Another board revealed a few early concepts for the Shrunken Zombie Head mug. The first was Shrunken Ned, the “Jungle Witch Doctor” at the South Sea Traders shop in Adventureland, and the other inspired by the fellows with fezzes in the Lost Safari scene from Jungle Cruise. Different swizzle sticks were initially devised for each drink, and this would have accompanied the Piranha Pool. I really hope Disney revisits some of these ideas in the future! 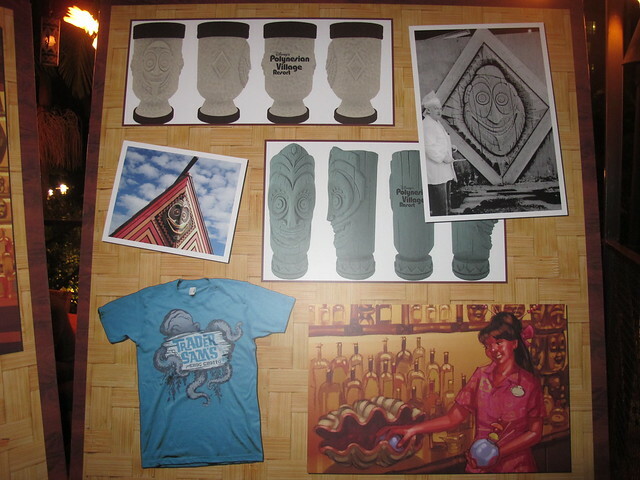 New to me at least were these previews of two tiki mugs paying tribute to Tangaroa Terrace at Disney’s Polynesian Resort. I’ll have to get my hands on one of the Trader Sam’s octopus t-shirts somehow — apparently it’s also just for Florida. We also got a sneak peek at the second edition of the Uh Oa bowl, which has a three wise monkeys (“see no evil, hear no evil, speak no evil”) theme. They said it should be available at Trader Sam’s Disneyland any day now. Special guest King Kukulele, who we always enjoy seeing at the annual Tiki Night at the Egyptian Theatre in Hollywood, led everyone in a sing-along of “Hawaiian War Chant” from the Enchanted Tiki Room. 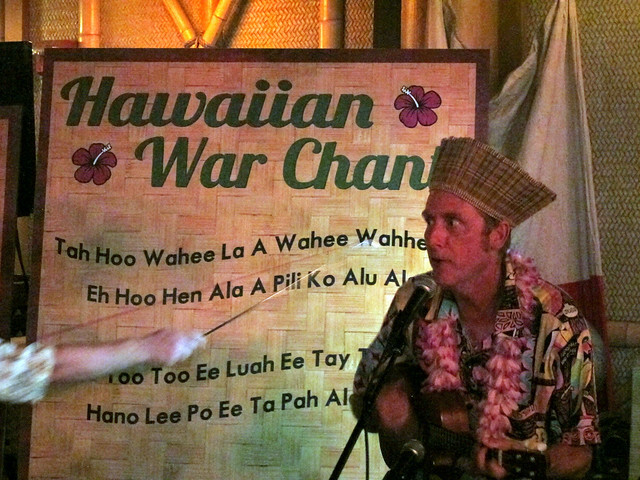 The Hawaiian musicians that usually perform on the patio also serenaded us. 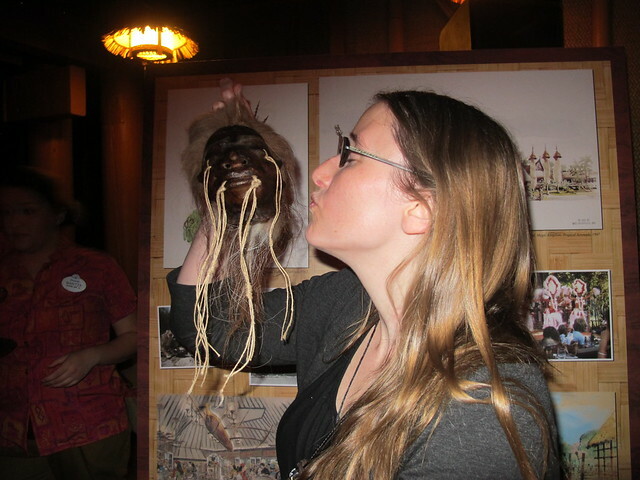 Since we were in the last group of the night, we weren’t rushed out of the event quite as quickly so I had the chance to pose with the shrunken head prop that Brandon had brought from Trader Sam’s. 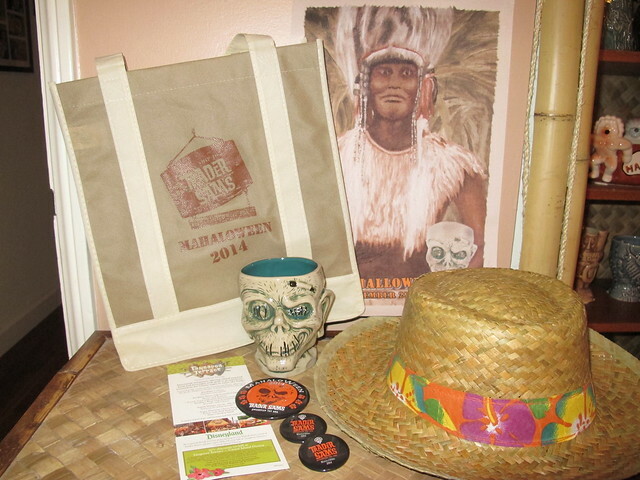 On the way out we were given our swag bags, which included the special event mug, hat, some Mahaloween pins, Tangaroa Terrace flyer/coupon and a canvas poster. 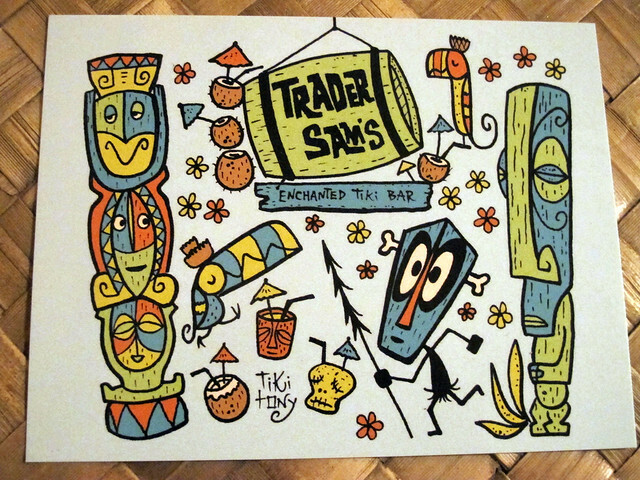 I must admit I was more excited to get one of these unofficial Trader Sam’s postcards that Tiki tOny‘s friend was handing out. I was given a few extra to give away here! Leave a comment on this post about your favorite part of the Halloween season and I’ll randomly pick three winners on Friday, Oct. 10. Glad to hear it was such a success! 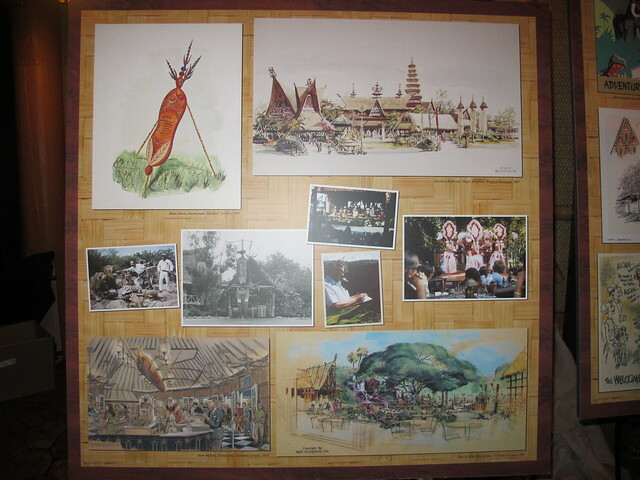 My favorite thing about Halloween is winning cool Trader Sam’s postcards from awesome blogs! 😉 My second favorite thing about Halloween is dressing up my Boston Terrier as a hula girl! Halloween has always been a big deal in my family since it is also my dad’s birthday. Hanging up scary decorations and coming up with creepy costumes is fun! We just put up our decorations today…in 99-degree heat! Favorite thing about Halloween is decorating the outside of my house and watching the Mad, Mad, Monster Party on dvd. Zombies; the Aku-Aku version, so I can drink more of them! Loved your review of the event; sounds like they figured out by your session that hand-shaking each drink was just not fast enough to match the crowd’s expectations. I particularly liked the repurposing discussion as well — I hope they’re able to encapsulate the spirit and fun of Trader Sam’s in Orlando. Halloweentime at DLR was a treat — the overlays in the Haunted Mansion and Space Mountain, along with all the themed decorations, lend a festive atmosphere and for an old Disneyphile, a sense of newness to an otherwise classic park setting! 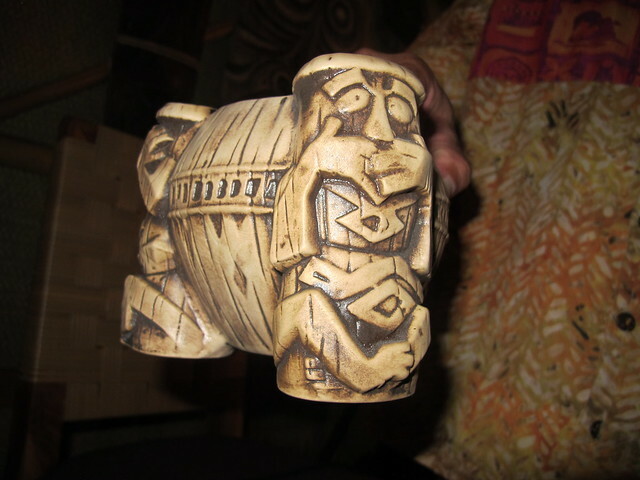 Yes, I think it’s the small details that really make Trader Sam’s great. Hopefully they’ll do likewise in Orlando. Nice recap, Tiki Chick. My girl and I were there and share similar sentiments on the event. But overall, am glad they are “trying” to do stuff like this. Particularly the inclusion if some “behind the scenes” and “sneak peeks” for Sam’s. Yeah, I loved the behind the scenes stuff. Oh, and my favorite thing was new info in Grog Grotto! Mahalo, Scott! I really liked the green and orange glaze too. I’ll have to put some of those shows on my Halloween viewing list. Thanks Tiki Chick! 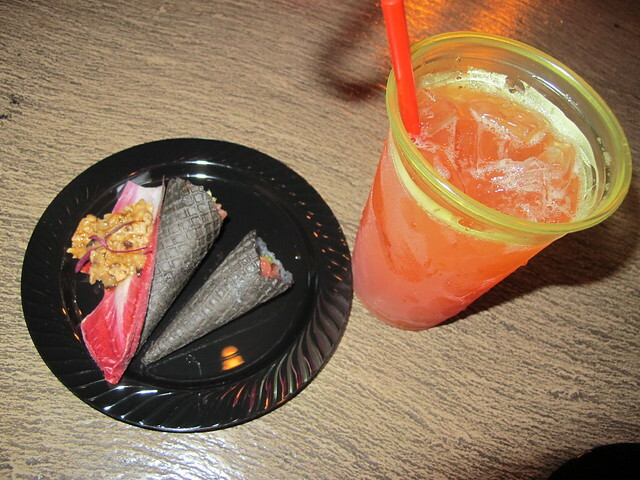 In case it wasn’t obvious, I love the local tiki bars and Trader Sams is such a friendly take with that Disney charm. Not sure what I love more, the atmosphere in these bars, the awesome mugs, or the wonderful drinks that come in them! Here’s a sample of my mug collection. Thanks for the recap. It was event I would have loved to have gone to, but living in the Midwest makes it hard to make these events (the last one we did get to attend was the 50th for the Tiki Room). 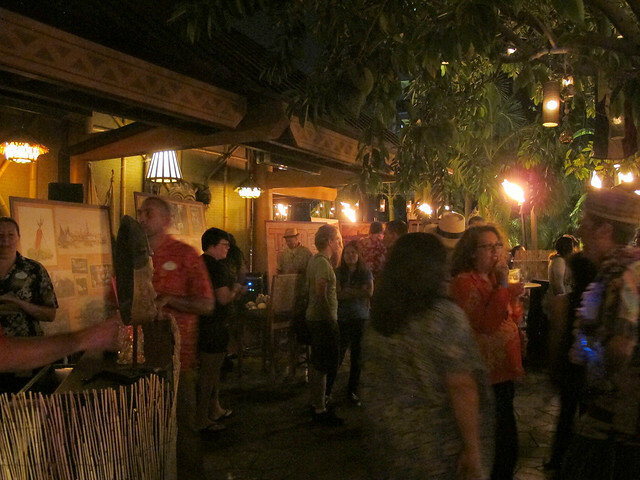 The photos are great to see what we missed- and from the sound of it, even though I can’t wait for the new Trader Sam’s to open up in WDW (which is a lot closer), the 30s/40s theming of the DL version will likely remain my favorite. As for my favorite part of Halloween, it’s got to be decking out the inside and outside of our house (yes, we’re THAT house on the block…), and getting to see how much fun the kids have when they come around for trick or treating, and getting to see their cute costumes! We need to work on our outside house decorations. All we have are a few (real) spiderwebs! We may be worse…we dress up our friend’s dog in costumes that coordinate with ours! My favorite thing about Halloween is inventing new holiday themed cocktails to sip while handing out candy. My favorite thing about Halloween is that it means Christmas is coming soon, which means I’ll be putting up my tiki/beach/shell Christmas tree! I can’t even wrap my head around Christmas yet! It was a super fun event and awesome meeting you and your Mom (fellow run Disney participants)! I love how excited my kids get about dressing up for Halloween! Halloween costumes made from cardboard boxes. Favorite part was meeting Elias the Werebaby at Mahaloween – see my FB page for photos! Love your Haunted Mansion costumes!! Congrats to Ninthleveldandan, Trader Scott and Jenny G! I’ll email you soon. My favourite thing about Halloween is just that atmosphere. Sitting, telling ghost stories, meeting the people coming to your door, it’s so exciting!